Black Diamond brake discs are supplied in 3 different styles depending on your driving style and use. 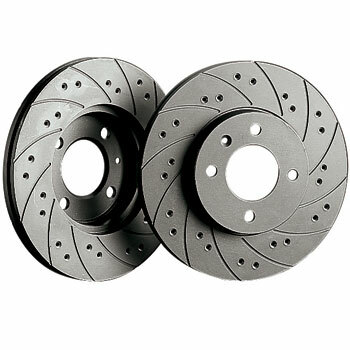 The discs vary in appearance and price but all 3 will improve braking response and reduce brake fade. Combined with Black Diamond�s own predator fast road pads no other brand offers such big improvements in stopping power! All our project cars have been fitted with black diamond brake discs and predator pads. Together they offer awesome braking performance!! In 10 years of dealing with Black Diamond we have never had a warranty claim. This fact alone speaks volumes about the brand and quality of materials used. You can�t go wrong if you buy Black Diamond. Massive price reductions ensure superb value for money, you wont buy cheaper from anywhere else! The combination discs are the most advanced brake disc that Black Diamond produce. The grooves increase friction between disc and pad resulting in a shorter stopping distance whilst the drilled holes improve cooling and reduce brake fade. These are the daddy of all discs and are ideal for powerful fast road cars and ideal for track days. The combination brake discs are the most popular style of disc we sell in the Black Diamond range. The combination brake discs are the first choice for many of our customers and we fit them to every show car that we build! TRUE quality!